More Mundane Meanderings › Yet another rider on the blogging bandwagon. As of this writing, the prices are just about the same as if you’d buy them from Microsoft. Another nice thing about them is that you can buy 1600 points, not just multiples of 500 points. Games on Xbox Live Arcade are usually 800 or 1600 points, so you won’t have any odd amounts of points left over. My absentee ballot arrived in the mail today from Washington state. I’m kind of out of the loop when it comes to state issues, so, Washingtonians, are there any particular issues and/or people I should vote for? Leave a comment if you want to lobby for my vote. On a side note, the Pierce county ballot has the new ranking-style voting (pick 1st choice, 2nd choice, etc.) instead of the standard either/or choice. Hopefully it works out well and it catches on elsewhere. If you’re ever in Cologne, stop by the Chocolate Museum. It’s pretty small, so it can be done in an hour or two, depending on how long you stay in the chocolate shop when you’re done. Inside the museum, they have a small production line set up that churns out little bit-sized bars of Lindt chocolate. You get one with your admission ticket. Here’s a video of some of it. Our house sale closed today, finally. It was a bit more of a hassle being overseas that it would have been if we were local, but it wasn’t too bad. Actually, the biggest problem we had was finding legal-sized paper to print out the final documents that the escrow company had sent us. After looking and calling all over the place, we eventually had to go bum some off of the legal assistance office at a nearby Army barracks. The final documents needed to be physically signed, so we had to print them out and send them overnight back to the States (overnight was actually two days, but still, not too bad for halfway around the world). It’s a bit weird to think that someone else is living in my house now, but it’s been quite a while since we’ve lived there ourselves. I hope they like it as much as we did. The veterinarian’s office called tonight. Elli passed away at about 11:00 PM, August 14, 2008. Carol and I miss her very much. 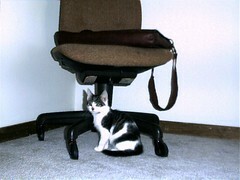 Elli as a kitten, taken with an ancient digital camera. She was my first pet after I graduated from college. I adopted her from the Columbus, Ohio Humane Society as a kitten in the Spring of 2000. She lived with me there for about a year until Carol and I moved to Cleveland together in the Summer of 2001. The house we were renting was much larger than the two-bedroom apartment in Columbus, and Elli enjoyed exploring it. Once, she found a gap in the floorboards on the second floor and crawled around between the floor and the ceiling, coming out after much cajoling, covered in a black, sooty-like substance. With Carol at work, I managed to give her a bath by myself, suffering only a few scratches. 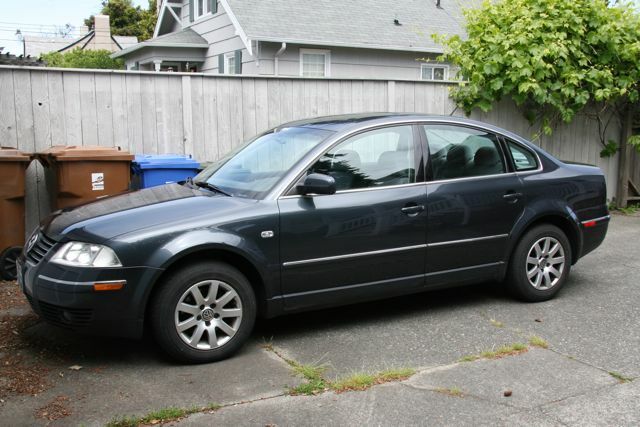 In 2003, we then drove across the country with her in a crate in the back seat, jammed between as much of our belongings we could stuff into a VW Passat. She didn’t especially enjoy the trip, but she didn’t complain too much and spent most of the time sleeping in the little litter box we had put in there with her. She didn’t use it as a litter box until the very last day of our trip. We moved into a two-bedroom apartment in Tacoma for a while we got our bearings and looked for a house to buy. The apartment was definitely a downgrade for Elli, but she made the best of it. She found a nice place to sleep while I worked from home on my computer: on top of my monitor. It was nice and warm, and she could keep an eye on me. Elli on the computer monitor. We bought a house in 2004, and it was a great place for Elli, with two floors, a big basement, and nice backyard. We found out that we could let her out on her own into the fenced-in yard, and she’d just wander a bit and nibble on some grass and then come to the door when she was ready to come back in. Often, she’d want to go right back out again. We got Freddie not long after moving into the house, and Elli was not very pleased about that. For many months, she was not as friendly with anyone, preferring to spend her time sleeping on our spare bed or by herself out in the yard. She eventually warmed up enough to Freddie to tolerate lying on the couch with all of us at night and even would lick him a bit when he’d come over to her with his head bowed, asking for some attention. I wish we could have stayed there for her, since I think the stress of the move was a main contributor to her stopping eating. Elli doing her favorite thing, exploring our backyard. I think the thing I will miss most about Elli is our nighttime routine. Every night, almost without fail, she would wait until I got into bed and then jump up beside me, wanting to be scratched. If I didn’t scratch her enough, she’d meow in complaint until I started again. Once she was satisfied, she’d lay down next to me for a while until she got up to go eat and do whatever a cat does at night. Going to bed tonight without her there really made it hit home that she was gone. Another routine that Elli had was bring us one (or both) of her two toys: a small stuff-animal sort of thing and an old white sock. She’d stuff one of them in her mouth and meow the whole time she was carrying it. If we were watching TV on the couch, she’d bring one to us, drop in on the floor by the couch and jump up to get scratched. In the middle of the night, she’d bring it up to the bedroom, meowing the entire way. She’d drop it on the floor, jump on the bed, and curl up and go to sleep. Sometimes, if we’d been away for a few days on a trip, we’d find them near the back door, as if she was putting them there as an offering so we would come home. 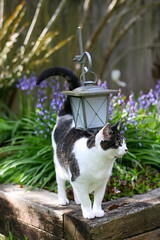 Elli was a great cat. She wasn’t all that friendly to strangers, but she was very affectionate to Carol and I. 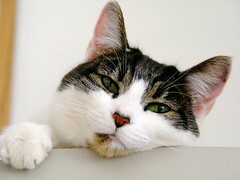 She also was her own cat, doing her own thing when she wanted to do it, but that always included spending time with us. We will miss her greatly. 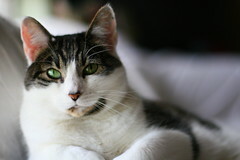 Our 8-year-old cat, Elli, is suffering from Feline Hepatic Lipidosis. She has been eating very little since we moved to Germany about 5 weeks ago and nothing at all for the past few days. When that happens to a cat, their body respond by breaking down their fat and sending it to their liver to be processed for nutrients. Unfortunately for felines, their livers aren’t all that efficient at processing fat, so it accumulates and can cause serious problems if the process isn’t reversed quickly. I am hoping we didn’t wait too long to take her to the vet. The military vet wasn’t equipped to provide the level of care she needed, so she’s now being treated by a local German veterinarian. She’s had x-rays, ultrasounds, blood work, and even some exploratory surgery to see if there is a blockage in her digestive tract. She came through that surgery fine, and no blockages were found, but she’s still in pretty bad shape. All we can really do now is hope that she can start keeping food down without vomiting and her liver recovers. I’m trying not to feel like we put her through unnecessary surgery, or that we’re doing too much to save a sick cat. The vet thought the surgery was the thing that should be done, so we went with it. It will end up costing us a fair number of Euros, but, hey, we get free people health care from the military, so that balances it out, right? We’re going to go visit her this evening after she recovers a bit from the anesthetic. Hopefully she’s awake and happy to see us. Update: We visited Elli and she was still sleepy from the anesthetic. The vet said her liver looked very bad, and the prognosis isn’t very good. We’ll have to wait and see how she is doing tomorrow, but there’s a good chance that her illness has progressed past the point of a recovery. To my friends: Does anyone want to sell my car for me after I go to Germany? You’ll make a nice 10% commission, which could be $600-$800 depending on how good you are. If not, that’s fine. I’ll probably end up selling it to a dealer or maybe donating it to charity if I my craigslist ad doesn’t pan out in time. Originally uploaded by Mike A. A taste of Germany, as made available by Top Food & Drug. This happened a couple blocks from my house. 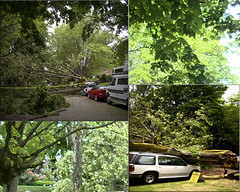 31st is lined with many beautiful, old maple trees, and one decided it had enough and flattened the truck parked underneath it. I found this photo because I follow Flickr’s RSS feed for photos tagged “tacoma”. We walked by this over the weekend and wondered how long it would take to show up on Flickr. Ich möchte ein Grande Americano, bitte. Carol and I go to Starbucks a bit too often, but it’s a nice walk after dinner and the baristas there are nice–one even donated a kidney to a customer! In any case, it looks like we’ll be able to keep post-prandial over-priced coffee tradition alive in Heidelberg. 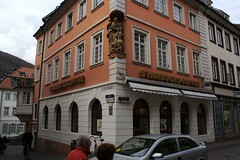 There are two Starbucks on the main drag through the old town. I found a picture of one by subscribing to the feed of pictures tagged “Heidelberg” on Flickr.